Mold Prevention is all about taking steps to reduce the likelihood of mold. It’s important to understand how mold grows for your health, property value and peace of mind. Before you can understand mold prevention, you need to understand mold. Let’s start by learning the difference between toxic mold, commonly referred to as “Black Mold” and good mold. Not all mold is harmful to humans. Mold is a fungus that develops in the atmosphere when the conditions are right. There are lots of good molds that naturally develop and can be used to our advantage. These molds can actually be good for us! Mold is used in many different industries, two of the most common are the medical industry and the food industry. If you’ve ever eaten a Mushroom, then you’ve eaten mold! Cheese is another example of mold in food. Blue Cheese is probably the most obvious, but most high end cheeses get their unique taste from mold. This is done through a carefully monitored aging process in a controlled environment. Everything from temperature, moisture and lighting is taken into account. Please DO NOT grow mold on food yourself and eat it! It’s very dangerous! The food industry has to follow strict laws and guidelines in order to operate and they also have years of experience! Bad mold is commonly referred to as “Black Mold” by the general public. There are many different types of toxic mold, not all of them are “Black” and Just because it’s black doesn’t mean its toxic mold either! Toxic mold comes in many different colors like white, yellow and green to name a few. These toxic molds usually grow on organic building materials such as drywall and wood. Toxic mold can be deadly and professional help is always recommended when dealing mold. The Mold Men use state-of-the-art products to remediate toxic mold and we never touch it without containment suits and respirators. Mold is measured by the number of spores that are present in a particular area. This measurement is called parts per million, or (PPM). The Mold Men of Pittsburgh offers detailed testing to measure the PPM. This gives us the information we need to properly remediate and remove the mold. It also tells us the type of mold and its toxicity. There’s a difference between outdoor mold and indoor mold. Generally, mold should not be present indoors in high concentrations. Low levels of indoor, non-toxic mold can be natural and should not cause a problem. High levels of toxic mold spores can be an indicator that indoor atmospheric conditions are out of balance. There are certain types of mold found indoors. These toxic molds thrive in dark and wet conditions with little to no air flow. These molds are generally referred to as “wet molds”. Wet molds are problematic and unhealthy. Some of these wet molds can be highly toxic and dangerous at even low levels. Stachybotrus and Chaetomium are two examples of toxic wet molds. Other types of mold produce what’s called micro-toxins. These micro-toxins can be a problem for the structure of a building and humans. This basic understanding of mold is important to know when starting the mold prevention process. Mold needs a water source in order to feed. Mold needs a feeding source like drywall or some other building material. 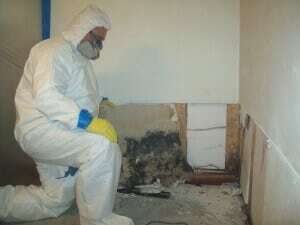 Mold thrives in dark stagnant places with high levels of moisture. Mold thrives on certain types of building materials. Building materials are the main feeding source of toxic mold. These type of materials are drywall, wallboard, ceiling tile, unfinished wood, the backing material on carpets, and on any product with a high consistency of paper. Mold grows in concealed and confined places with high levels of moisture and low light conditions. building materials in these areas are a breeding ground for mold. Some of the best places for mold to grow are behind walls, in attics and in basements. Mold spores grow, feed and spread at a more rapid rate when the temperature is between 65°F and 100°F. The problem is that this range is normal for most indoor environments. When you couple all of these things together you get the perfect conditions for mold. If you want to take mold prevention steps, then you need to make sure that you follow these guidelines. A water source such as leaky pipes are going to be the trigger that starts the mold growth. Out of all the conditions listed above, Water is probably the one thing within our control! Keeping certain areas in your home dry will prevent the mold from ever growing and save you money in the long run. If you need our services please Contact Us for a free in home evaluation!